This lesson covers the development of 'involute' gears. An involute gear is based on an involute curve, which is a mathematical shape. This article includes simple steps for generating involute curves then followed by simple extrude in Pro Engineering software. Involute curve is generated by simple equation. This article deals with complete procedure to make involute profiled gear modeling in Pro-Engineer software. Follow the steps to get ahead. 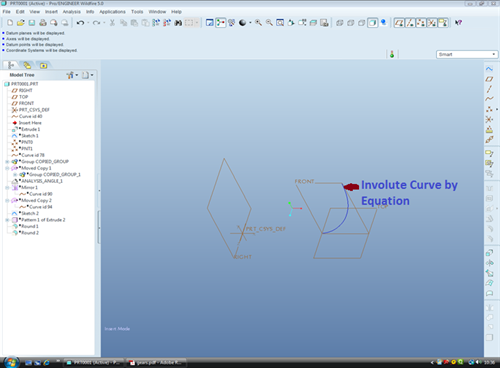 STEP:1 Generating involute curve by an equation. STEP:3 Create three circles representing the major diameters. 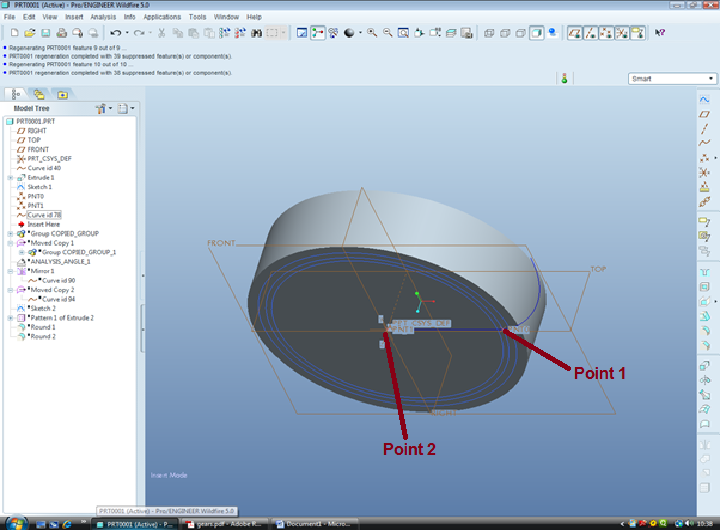 STEP:4 Create a datum point a datum curve. Set the selection filter to Datums, pick the involute curve and the 6.000 diametercircular sketch, then pick the Point icon and then pick OK to create a datum point. STEP:5 Create a datum evaluate feature. STEP:6 Mirror the copied involute curve. STEP:7 Copy the curve again. STEP:8 Copy the curve again. Create an extruded (through all) cut using the edges of the curves as shown below Trim the sketch as shown below. 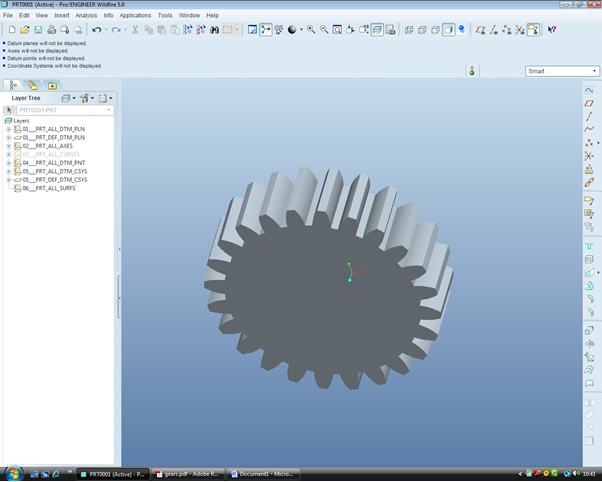 This article is all about making of Spur Gear using Pro-Engineer Cad software. It is very difficult to make gear in Pro-E, but this article gives very easy way of making Spur Gear. First calculate all the parameter required for spur gear. Final model can be used for analysis and making drawing. Illustrator CS6 follows the rest of the suite in offering an optional dark look and feel. Vhile Photoshop has a preset range of tones; Illustrator offers a smooth gradation from dark to light, with stops at points corresponding to Photoshop’s tour options. Officevibe is one of the latest gamification solutions launched for enhancing and rejuvenating the work atmosphere at the workplaces. It promises to improve productivity, team spirit, creating a healthy atmosphere encouraging employees to boost up their involvement and commitment to their companies. Check out its features and our review and see if it really delivers up to its promises. Yammer: Does it increase Office Productivity through its Internal Social Network? Yammer is an internal social networking app for the organization that is crafted to build up a strong bond between the employees. It is an app especially useful for hose enterprises which are spread over in various branches to develop a more smart communication among the employees unknown and distant to each other. Check out the features whether it is the appropriate one for your organization as well. This is an article where I try to jot down those essential tools which increase the productivity of any organization by boosting up the morale and encourage their creative acumen. Today, socializing is the mantra of success. So, a social network has to be installed within your office premises as well. That would make the picture perfect within your enterprise. Check out how. I am using Pro E Wildfire 5. I cannot find the evaluate feature, refer step five. Is there any other way around it? Regarding this example, where did you ever refer to Base Diameter circle that is required to create the involute curve? Why apply a rotation angle of -30 degrees when the resulting curve/geometry is never shown on your screen shots?